What others say about chiropractic care can help you make the right health care choice. 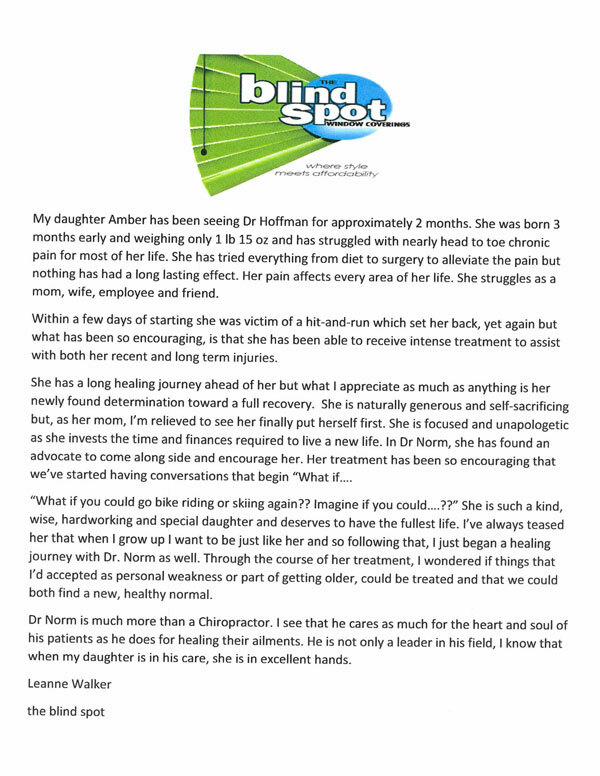 Review a selection of Hoffman Chiropractic & Wellness Centre patient testimonials below and please email me or contact the office if you have any questions. Dr.Tim was wonderful at explaining everything to me, making sure I had a thorough understanding of what my test results showed and what we would do to fix it. Jillian V.
Everyone was kind and courteous and efficient with our time. Overall really it was informative and encouraging. Aaron O. Examination was very thorough. Staff was friendly. Amber works with new patients and she was awesome. She treated me with respect and was very friendly, putting me at ease. Dr. Hoffman recognized my health issues before I even told him about them. Jeanne H.
Thank you for such a thorough, respectful assessment for our teenage daughter. We were very impressed by the technology and knowledgeable staff. Toni P.
Very impressed with Dr. Hoffman and his assistants, more then confident that I visited the right place for help. Darren P.
First impression is always a good thing and upon entering the center it was a warm and caring atmosphere from reception to primarily preparation. It has me wanting to come back just for the smiles and cheerfulness. Great job Hoffman Associates Team! Phil P.
Dr. Hoffman presented with an outstanding knowledge in all aspects of holistic medicine. He helped me way beyond what you generally expect from a chiropractor. I have recommended him to all my friends. Thomas L.
Dr. Hoffman is skilled, efficient, and caring. I like that he can muscle test to find problem areas. Dr. Hoffman is an important part of my preventative care program. Pam H.
Dr. Hoffman is thoughtful and considerate. He takes a genuine interest in his patients. he is thorough, and will work hard to ensure his patients reach their optimal health. Danielle C.
Dr. Hoffman is awesome, he listens to your concerns and explains what he is doing and why. Brenda C.
Dr. Hoffman is dedicated to making all of us feel better. He is truly a great man. The clinic is clean, the staff are friendly and efficient. Appointments are on time. Brenda W.
Dr. Hoffman has gotten me back to a reasonable level of life activities. I was unable to walk when I first saw him. He is unlike any other chiropractor I have seen before, and I have seen lots. Geoff A.
Dr. Hoffman is the most amazing doctor that I have ever seen in action. He helps people with problems so varied, it is almost a miracle. He is generous and kind and always treats the cause, not the symptoms. Priscilla B.
Dr. Hoffman doesn’t just do adjustments to get you out the door. He takes the time to listen, and help to eliminate chronic issues and reduce your visits over time. Patrick G.
We love how thorough Dr. Hoffman is with all his first visit tests! We were shocked how many things he checks over! Very happy! Raeleen M.
Dr. Hoffman always puts his patients comfort and concerns first. He continuously goes above and beyond to solve any health concerns not just masking or temporarily making you feel better. Kelsey E.
Very welcoming and comforting environment for the whole family. Kayla W.
I had traveled a long way for the appointment. I felt that Dr. Hoffman, and his staff, respected that and allowed extra time for me and did a very thorough first visit. I am very satisfied with my first visit. Lois M.
Thought your staff was very professional and Wade took the time to explain the x-rays he took and made me feel relaxed, and my neck pain has subsided. Bruce K.
The assessment I received from Dr. Hoffman and his team was the most thorough I’ve ever experienced, and I’ve been to a lot of chiropractors. I’m eager to hear the results and begin treatment! John M.
Thankful for Dr.Hoffman and his team! Excited for my family to be given the opportunity to receive treatments that will maximize our performance, lifestyle and health. Kristy F.
For the first time in along time I’m pain free! Kayla S.
Dr. Norman Hoffman is one of the best chiropractors who I have met. He helped me alot with my son and thanks to him my little boy gets better and better! I really trust his advice and knowledge. Ieva M.
I had so many symptoms for months, and nothing would help! I have been coming for almost 6 months and I am feeling amazing. Jenny H.
Great service. He has made every effort to provide information and resource to improve my overall health. Gives great care in each detail. Stephanie G.
Dr. Hoffman is very knowledgeable and patient. He explains procedures very clearly and relates them to his patients in terms they can understand. Jean L.
He cares, and he is progressive with educating us to be healthier. 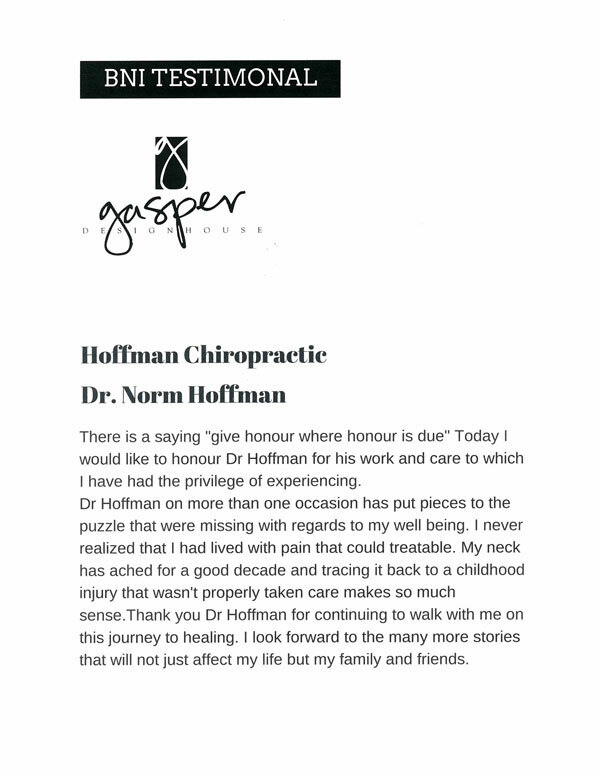 Danalee G.
An uplifting testimonial from a Red Deer woman, about the amazing transformation she has undergone in a short period of time after coming to see Dr. Norman Hoffman. A mother who found herself in the same situation as many other women, anxious, unable to concentrate and focus, and feeling like she was “on” all of the time. She made the decision to do this for herself, and it has changed her life! 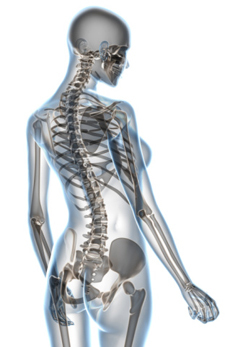 “I have suffered for the past three years with serious degeneration – lower lumbar, spine, and neck. My ribs wouldn’t stay in place and I had such pain in my legs that I had to use a cane to walk. I saw several medical doctors and other chiropractors, and I was told that I would not be walking at all in two years. After about six weeks of care from Dr. Hoffman, I felt very good again! 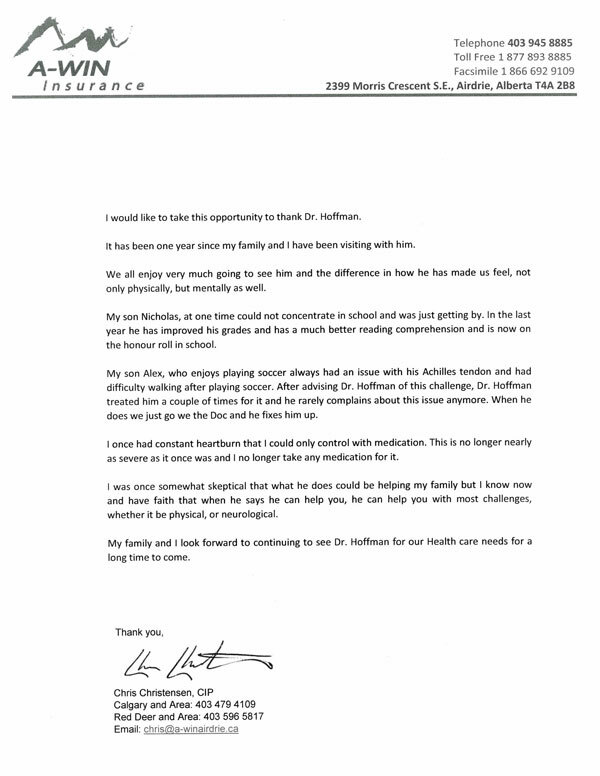 This testimonial is from a mom who has seen great improvements in both her son’s balance and sleeping patterns since coming in to see Dr. Hoffman. It’s worth the watch just to see the cameo from Madyx at the end! This testimonial is from a grandmother who brought in her grandson after experiencing wonderful results with Dr. Hoffman herself. Joan talks about how her grandson, since coming in to see Dr. Hoffman, has put on weight, become less hyperactive, and is enjoying school more this year. This is a great story of about a renewed sense of hope! This wife and mother tried everything to feel better, and get her life back. She sought out the advice of medical professionals, neurologists, etc. with nothing giving her the relief that she needed. After being under Dr. Hoffman’s care she is finally feeling like herself again! Kerrie talks about her daughter’s progress in reading and focus in school. This little girl no longer needs her glasses and now enjoys reading after coming in to see Dr Hoffman and getting regular adjustments. What parent wouldn’t want to see these kind of results in their children! It’s awesome to say the least! Kerrie talks about her husband’s experience with shoulder pain that just wouldn’t go away even though he had been to see other chiropractors. After coming to see Dr. Hoffman for one adjustment, the shoulder pain was gone! “I have a frozen shoulder with very limited use of left arm. Since coming to the clinic I have MUCH more freedom of movement and MUCH less pain. I can do my own hair again. I can work a full day at the computer pain free! I can reach for things without sharp jabs of pain! I can even fight with the cat (and win) and can make sudden evasive moves with my left arm!